Buying a whole chicken runs about $1.27/lb. average (in my area) and is much cheaper than buying the parts separately. Breasts are on the average $3.99/lb. and legs/thighs go for $2.19/lb. Don’t get me started on wings! Cray cray on those prices! We also raise our own meat chickens, and usually leave them whole when we process them. Don’t get me wrong, we like eating whole roasted chicken once in a while, but there are times when I just want hot wings, or to use the breasts for a recipe. So, I cut a lot of them up to use in that manner. 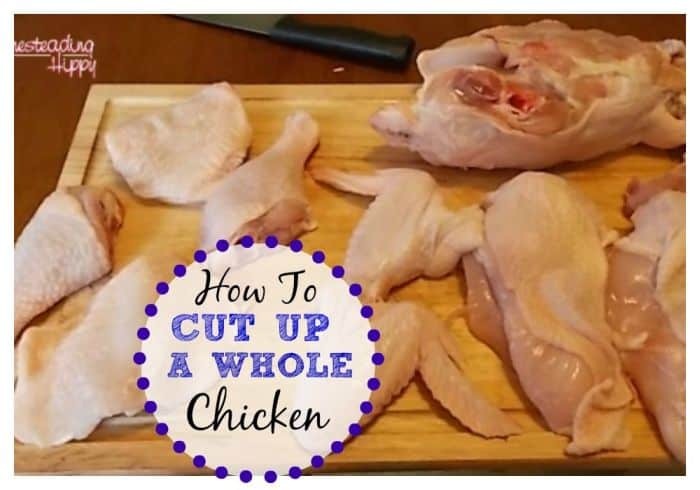 Learning how to cut up a whole chicken is easy. Be sure to watch the video below for more help! Begin by placing the whole chicken, breast side up. You want an extremely SHARP knife to work with, to minimize slippage and possible injury. Start your cutting down the “fat line” of the inner thigh and leg piece together. Then, you will “pop” the thigh joint to get it to lay flat. Repeat on the other side. Keep the legs and thighs attached for now, to stabilize the bird. Then, carefully, slice down the breastbone to remove the breast. Carefully, cut around the entire breast along the “fat lines” and remove. Repeat on the other side. Next, you will remove the wings along the joint. This may require you to turn the bird slightly to get under the joint. Go back to the leg and thigh quarter, and follow the “fat lines” to remove. Repeat on other side. To have the legs and thighs separate, simply place the knife in the joint area and “pop” it down to cut through. This is another reason to have a really sharp knife. If you want to skin the thighs or breasts, this is a good time to do it, too. You now have a fully fabricated chicken! You can use the pieces any way you wish, and the carcass makes a wonderful bone broth! Follow the post here to make bone broth in your InstantPot, too! What will you do with your chicken pieces? To get some delicious budget stretching recipes, read the post here. Be sure to pin this for later, too! Great picture tutorial. I could really use this. Definitely need this for when we process our own chickens. Thanks for the detailed tutorial! Yes, good tutorial. My dh cuts up the chickens for me, though I hate waiting for him to get home to do it. Your method is way better than mine, I will be switching over 🙂 You make it look so easy, so we will see how it goes. It really is amazing how they overcharge for those chicken parts. It takes a little more elbow grease to cut up the chickens yourself, but the savings are so worth it. This is SO handy! I’m the worst at this. I always ask my husband to do this. Now, how about de-feathering one!? Thank you for this! It has been bothering me for quite some time now that I didn’t know how to cut up a whole chicken! My mom would even fry the back. She didn’t waste any part. She even fried the liver, gizzard, and heart. With 6 people to feed, you didn’t waste any part. i like using kitchen sissors. they dont slip near as much as a knife. This is great, the pictures make it so easy. I’ve never had to cut up a whole chicken because we have so many mouths to feed. Thanks for sharing this! I bet I could fit more than one chicken in the crockpot if I cut it up. I may have to try it next time! This is perfect! I think I’m going to email this article to the peeps who said they’re going to help us slaughter chickens. We usually freeze them whole, But I think I want to part them up this time. Thanks! This is great! We have been getting whole chickens a lot lately. Can’t wait to follow along with this tutorial! This is a great help. Butchering is often what stops us from raising chickens. It’s great to see the photos that make it so much easlier. This is unbelievably helpful! I find a whole chicken so intimidating. Thank you!! I am so glad to hear that!! You are welcome! My meat birds are peeping away right now. In a couple months I’ll be doing the same thing! I have cut up lots (and lots, and lots) of chicken, but I was entirely self-taught. I knew it had to be easier than what I was doing. I used your video today to cut up one and I can’t thank you enough. It was great. I was even able to preserve the little “oyster” of meat on the back of the thigh. Could never do that before. This will certainly make butchering time easier. That is awesome! I am so glad that you found the video helpful!! !